Gregory Patterson, WaterTower Theatre’s Managing Director, today announced the appointment of Kelsey Leigh Ervi as Associate Artistic Director. Ervi, the Company's Artistic & Marketing Associate since 2014, will assume her new position effective immediately. The newly created position reports to the Managing Director. In her new position, Ervi will have overall responsibility for artistic and production related matters. "There is no one better qualified and prepared to help lead the Company through this transition than Kelsey," said Greg Patterson, WaterTower Theatre's Managing Director. "Kelsey has established herself as one of the most dynamic and forward-thinking young artists working today. Having worked directly with Terry Martin for several seasons at WaterTower, Kelsey understands the legacy we all inherit as well as the importance of ensuring our high artistic standards continue and are enhanced going forward. I can think of no better person for this new Associate Artistic Director role than Kelsey." 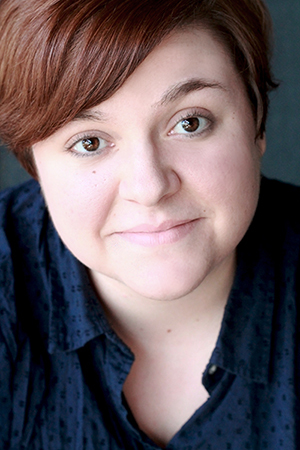 Kelsey joined WaterTower Theatre as Assistant to the Producing Artistic Director in January 2013. In 2014, she was promoted to Artistic & Marketing Associate, as well as Co-Producer of the Out of the Loop Fringe Festival. For the last four years, Kelsey has cultivated a highly respected and dedicated career as a multidisciplinary theatre artist. She is considered one of Dallas’ top young directors. Her work has been seen on many Dallas stages including WaterTower Theatre, Echo Theatre, Rite of Passage Theatre Company, Shakespeare Dallas, Festival of Independent Theaters and Greyman Theatre Company. Most recently, she directed the regional premiere of Lord of the Flies for WaterTower Theatre, as well as the critically acclaimed production of Precious Little for Echo Theatre. As an actor, Kelsey was most recently seen in Shakespeare in the Bar’s production of Richard III and Mr. Burns, a post-electric play at Stage West (Dallas-Fort Worth Theater Critics Forum Award - Best Ensemble). Other favorites include The Most Fabulous Story Ever Told (Uptown Players), [sic] (Echo Theatre) and The Winter’s Tale (Shakespeare Dallas). Next up, Kelsey can be seen in Bright Half Life in the Studio at WaterTower Theatre. Kelsey's play The Spark received its world premiere production in the 2015 Out of the Loop Fringe Festival, where it was named "Best of Loop." Another of her plays, Waking Up, was produced by Greyman Theatre Company in 2012. When she’s not working in theatre, Kelsey can be heard talking about it. In November of 2015, Kelsey joined forces with two other Dallas artists and launched the Little Big Scene Podcast, a bi-weekly podcast which serves to promote the past, present and future of the Dallas-Fort Worth theatre community. WaterTower Theatre is one of the leading regional theatres in North Dallas and Texas. The upcoming 2016-2017 Season will be the Company’s 20th. The Company is consistently recognized for its artistic excellence by the Dallas Theatre League, Dallas-Fort Worth Theater Critics Forum, The Dallas Morning News, The Dallas Observer, D Magazine, and The Fort Worth Star-Telegram, among others. WaterTower Theatre has a subscription base of more than 2,000 subscribers and serves an audience of over 28,000 patrons annually. WaterTower Theatre is a 501(c)(3) non-profit organization as designated by the IRS. Like all arts organizations, WaterTower Theatre relies on both ticket income and donations from individuals, corporations, foundations, organizations, and government to produce world-class live professional theatre and offer community outreach and arts education programs. WaterTower Theatre is grateful for the support provided from The Town of Addison, TACA, The National Endowment for the Arts, the Texas Commission on the Arts, the Schubert Foundation, and the hundreds of individuals, corporations and foundations whose annual donations make live professional theatre possible in The Town of Addison to be enjoyed by all in North Texas. WaterTower Theatre is set to announce its 2016-2017 season in late May or early June.